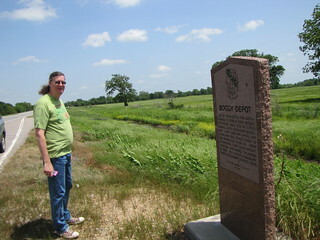 Site of town noted for distinguished citizens in state history. 1st house build 1837 by Cyrus Harris. Later Chickasaw Governor. Later Choctaw capital and overland mail stage stand to San Francisco (1858-61). Home of principal Chief Allen Write. Choctaw, who named Oklahoma in 1866. Rev. Chyrus Kingbury, noted missionary buried here. Oklahoma Historical Society 178-1995. 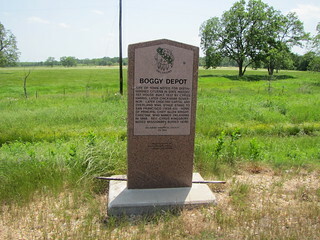 Boggy Depot State Park is about 4 miles south of this marker. Turn to park is just east of this marker before the bridge. Road sees like a badly paved one lane road, it is, but it will take you straight to the back part of the park near the cemetery.